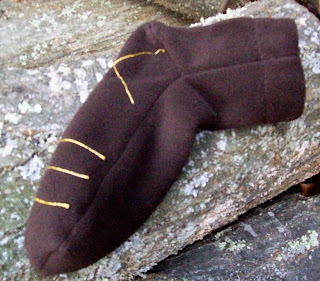 I did the fleece slippers for my boys (and girls) shop, GriffinGear and decided I needed some for the larger footed adults in the world, so, new from my shop Pandys, adult fleece slippers. You pick the size and color and I do the rest. My husband told me my old slippers gave him the creeps. They were the suede ones with the fake sheepskin lining. Very warm, but he said that's what his mom wore. I had another pair that were more of a slide slipper. I hated the fwap, fwap, fwap noise they made. And, for those of you that know me....I am not the most organized and tend to take things off here and there and never remember where I left my shoes, keys, wallet, phone, etc. So, I can run downstairs, slip on rainboots or winter boots, do what I have to do, then take my boots off and I still have my slippers on my feet. Can't do that with other types of slippers.